I usually avoid making plans during and after the first week of school since I'm so brain-fried from all the introductions and explanations, but yesterday turned out to be a good day to get together with some lovely people I know, so we scheduled a dinner. I was tasked with dessert and had no idea what I was going to do until I thought about doing something with peaches or nectarines. White peaches and nectarines are a little piece of heaven. So are yellow ones, and you could absolutely use those if you preferred. 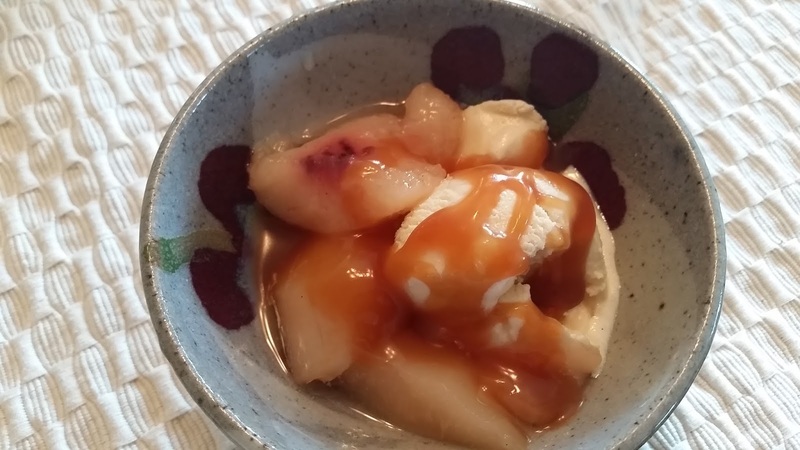 Poached and served with some vanilla ice cream and a little caramel sauce...oh boy. Somehow my scattered brain was able to make these connections and pull this lovely dessert together after a little research on marthastewart.com, bbcgoodfood.com, and some other site I can't remember right now! For poaching, you want fruit that is almost ripe or just barely ripe, not too hard and not too soft. Fill up a tea kettle and bring it to a boil. Cut an X in the bottom of each nectarine. 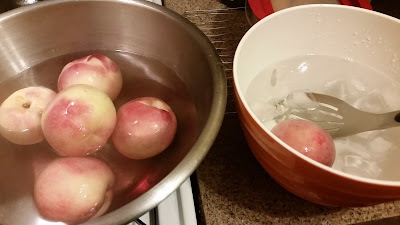 Set up one heat-proof bowl with the nectarines and another full of ice water. Pour the boiling water over the fruit and let sit for 30 seconds to one minute. Remove from the hot water and place in the ice water to stop the cooking. When the fruit is cool enough, peel the skins. 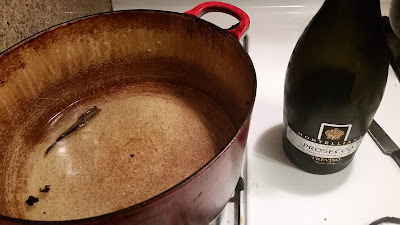 Bring 1 bottle of Prosecco, Cava or Sparking Wine of choice to a boil (or one bottle minus one glass, if you're so inclined). Scrape the seeds from 1/2 vanilla bean; add seeds and pod to the pot. Add juice of 1/2 or 1 lemon and 1 cup of sugar. Stir until the sugar is dissolved. Add peeled nectarines and add water if they're not covered by the liquid. Simmer, turning periodically if part of the fruit keeps poking up through the liquid, for about 12 minutes until a knife slips into the fruit very easily. Remove the fruit from the pot and pour off about a third of the poaching liquid. Bring the rest to a fast boil and cook until reduced by at least half. This could take 15 to 30 minutes...it felt like forever last night since I was tired! When the fruit is cool enough to pick up, cut in pieces. It's very beautiful cut in halves, but I discovered in my attempt that I had bought cling nectarines that hold on to the pits for dear life. Had I realized, I might have looked for freestones, but they taste delicious either way. 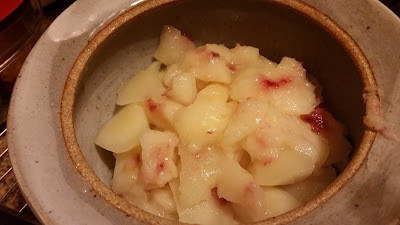 Let the reduced syrup cool to warm or lukewarm and pour over the fruit. Let it all absorb together at room temp for a few minutes, then refrigerate until a little while before serving.